Our goal is to push your Yelp page off page 1 when customers Google your business. The Pinza Group is a real estate firm in California and they agreed to be a case study for our Yelp Suppression program. 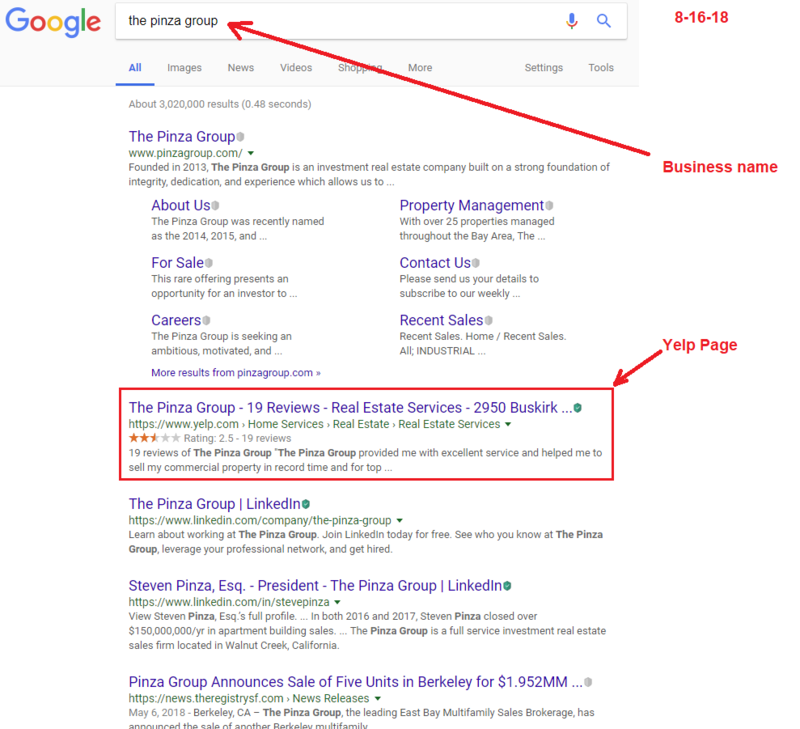 Prior to our work, when you Googled “The Pinza Group” you would see their Yelp page ranking #2, right below their company website. Steve and his team at The Pinza Group is one of many businesses who feel victimized by Yelp and don’t want to have to keep dealing with negative feedback and losing customers. They want Yelp out of their life! The screenshot below was taken on August 16, 2018 before we began work. We create a new business name, address, phone number, voicemail and website for you. Below is what we did for The Pinza Group. The business name is chosen at random and must be very different from your actual business name. The address must be a physical address and we sometimes have to actually rent an address. It must be real and verifiable, as if the business actually operates and receives mail there. We always choose a different city. For phone number, we setup a local number, usually with a fresh area code from the one the business already has. Finally, we buy a domain reflecting the new business name and have the site custom-designed to appear as if it’s a real business. Of course, we put the name, address, and phone number right on the site, as this is how Yelp verifies the changes. Now, we login to your existing biz.yelp.com account. You will need to supply us with your username and password. We change all information to reflect the new business. It usually takes 24-48 hours for Yelp to accept the new information. Notice how all business information was successfully changed in Yelp. It takes about a week or two for Google to re-index it’s search results. But when they do, we expect to see your Yelp page fall off page 1 when you Google your REAL business name. That’s the goal and when that happens and you’re satisfied, we earn a bonus. 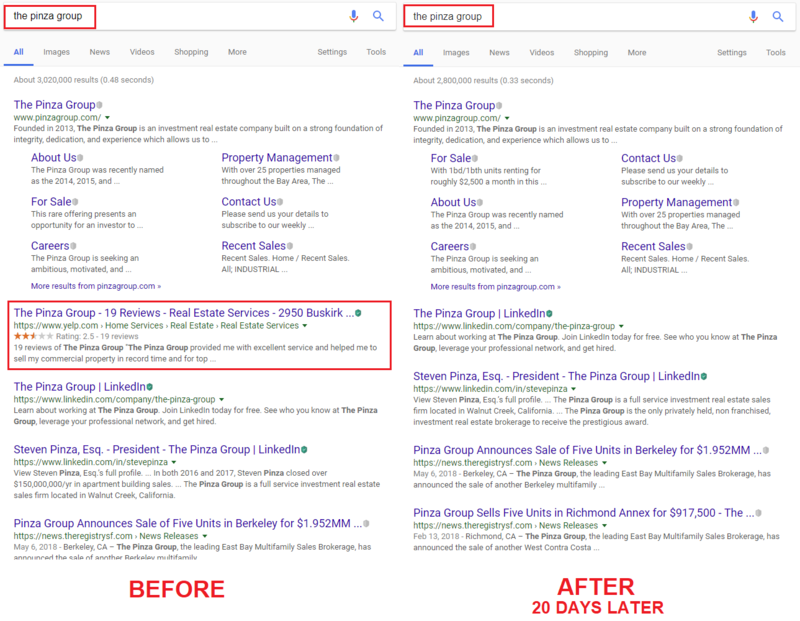 You can go to Google right now and search for The Pinza Group. And that is how we push Yelp down so it’s out of your life! 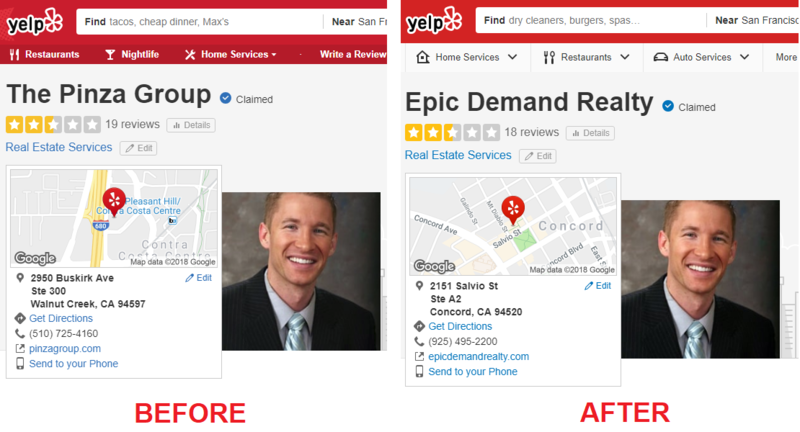 We are paid a 1-time bonus if when Googling your business name, your Yelp page has fallen off page 1 of Google search results. That is the goal: To make it so you never have to worry again about Yelp costing you customers. From the time we receive your payment info and Yelp login, it takes about 30-45 days to complete everything. How much is the 1-time upfront fee? How much is the bonus? Contact me for details mikemunter@gmail.com or 503-890-6663. If my Yelp page does not drop, do I owe you anything more? No. The only risk you have is the upfront fee and that is just to cover our hard costs. We make our money if/when this is successful. You agree to pay the bonus if your Yelp page falls off page 1 when Googling your business name. Does this effect my existing business name? No. You operate as you always have. We’ve developed this strategy as an affordable way for businesses to push down Yelp and not have to deal with them any longer. Our work doesn’t have any other impact on your business, aside from trying to get rid of your Yelp page where your clients won’t see it. Will Yelp eventually catch on and just make a new page for my business? So far, they haven’t, but we can’t control what Yelp may do in the future. Call, email or complete the contact form below! We need your biz.yelp.com username/password to verify that your Yelp Page can be changed. We check this before beginning work.